When you look around your workplace, do you ever wonder why some people seem to constantly be reactive, while others are more proactive? When you think about your group’s business/account planning process, does it stimulate new insights and fresh plans, or simply repackage last year’s tactics? Either way, your answer is the result of a habit. A habit is defined as, “a behavior pattern acquired by frequent repetition; an acquired mode of behavior that has become nearly or completely involuntary.” Depending on the behavior, the habit can be positive (e.g., exercising each morning) or negative (e.g., uncontrolled gambling). The goal is to foster positive habits and transform negative habits into positive ones. An anyone who has tried to break a bad habit knows, it’s much easier said than done. This neurological loop is at the core of our habits, both good and bad. The cue for a positive habit like exercising in the morning might be your dog waking you up at 6 a.m. with a lick on the hand. The routine would be jogging along the lake, and the reward is an ice-cold, chocolate protein shake. The cue for a detrimental habit like uncontrolled gambling might be boredom. The routine would be going to a casino and playing the slot machines, and the reward is the excitement (or lack of boredom) that comes from winning or from the near misses of almost winning. All habits follow this route of cue, routine, and reward. We can use this habit model to improve our approach to strategy by creating good habits and eliminating negative ones. 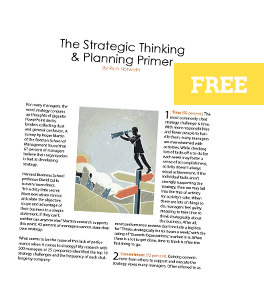 A nearly universal business habit that can be enhanced in many cases is strategic planning. For many organizations, the cue for this behavior is the calendar. As the calendar hits October or November, it triggers the routine or behavior of strategic planning. The more seasoned, or cynical, manager might describe the routine as filling out a bunch of templates that create a huge PowerPoint slide deck. The reward is a sense of accomplishment, or relief, and a tangible plan. However, with just a few adjustments, the strategic planning process can be made much more productive and relevant. The first adjustment keeps the same cue (calendar), but instead of an annual trigger, it becomes monthly. The monthly cue triggers a new routine consisting of a half-day strategic thinking session to accumulate new insights and review existing goals, objectives, strategies, tactics, and metrics, and make the appropriate modifications. The result is a real-time strategic action plan that is highly relevant, drives people’s daily activities, and instills greater confidence in the strategic direction. 1. What is the top strategy habit you’d like to change for the group? 2. What is the cue, routine, and reward? 3. What new routine could you substitute to transform the habit? 4. What resource allocation changes would need to occur to create this habit? 5. What cultural or organizational changes would need to occur to ensure the habit lasts? They say a habit is hard to break, so start a few good ones.